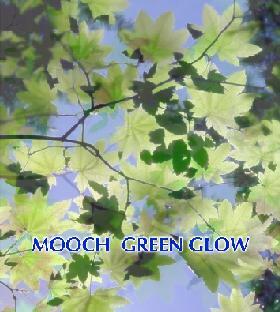 Mooch - "Green Glow" / Erich Z. Schlagzeug's Mooch II - "Green Glow"
Though billed as a Mooch album, Green Glow was recorded entirely by Steve Palmer using synthesizers and drum machine. The album consists of 3 tracks, all in the 18 minute range, and all part of a continuously evolving theme. Part 1 sets the tone for the album with pleasant melodic keyboard/synth music. Hmmmm…. I can't say I care for much of the sounds, which strike me as if Steve has taken a step back in terms of available technology. The electro-rhythms sound kind of old time home recording cheesy and I don't care for the sound of whatever is producing the main keyboard melody. The surrounding spacey soundscapes are, on the other hand, pretty cool and manage to save the day. Overall I'd describe it as Space-Prog LIGHT. It develops nicely but just doesn't get me excited (and those electro-rhythms are really grating). Part 2 starts off as more of the same. But as the piece progressed it struck me that musically this is similar to the songs heard on the Mooch 60s inspired albums - 1966, 1967 ½ , and 1968a, although those were short, fully developed songs. That helped me warm up to the music more because I like those albums a lot, and the keyboards are increasingly more lush and "feel" better as we get deeper into the album. And about halfway through Part 3 Steve surprised me by bringing in guitar, which adds some much welcome trippy color to the music and ends the album on a high note with nice drifting spacey psychedelic music. I also like the almost jazzy keyboard sound that accompanies the guitar. But now things get really interesting. 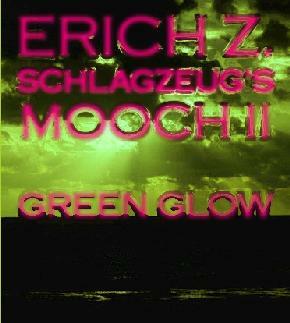 It turns out that Steve and Mooch drummer Erich Z. Schlagzeug originally collaborated on the creation of Green Glow but apparently came to some disagreement and went their separate ways for the project. Being of independent mind and revealing his inner rascal, Erich went ahead and recorded his own version of the album billed as Erich Z. Schlagzeug's Mooch II, with assistance from Mooch electronic wizard Dave Dilliway. AND… Erich boldly proclaims his to be the "real" version of the album. It's definitely the same music but seriously ENHANCED. We've got Erich's drumming and I immediately like the keyboard and synth sounds better. Erich gets a nice groove going and I like the combination of spirited drumming and dual piano and synth melodies. Throughout the album it gets psychedelically jazzy, proggy, and nicely spaced out, moving through its various themes fluidly and using better instrumentation to flesh out the sound and some much needed pizzazz. And Dilliway lets loose with audio generators near the end of Part 3 which sounds pretty cool as the rest of the music is winding down for the finale. So… yeah, Erich isn't just boasting. He's got a leg up on Steve with his version. Die-hard Mooch fans should get both and compare for themselves. Everyone else…. Go Schlagzeug!